Little darling was very touched with Maram & A God loving anonymous who shared their meaningful insight on my recent title, "Five Regrets of The Dying". She would like to share a wonderful story for these special readers of mine. She titled it as... "Angel comes in many forms. Dad ignored me.. "Did you hear me, Dad ?" I screamed. At those words Dad whirled angrily, his hands clenched at his sides, his eyes narrowed and blazing with hate. We stood glaring at each other like duelists, when suddenly the pointer pulled free from my grasp. He wobbled toward my dad and sat down in front of him.. Then slowly, carefully, he raised his paw..
Dad 's lower jaw trembled as he stared at the uplifted paw Confusion replaced the anger in his eyes. The pointer waited patiently. Then Dad was on his knees hugging the animal. It was the beginning of a warm and intimate friendship. Dad named the pointer Cheyenne . Together he and Cheyenne explored the community. They spent long hours walking down dusty lanes. They spent reflective moments on the banks of streams, angling for tasty trout. They even started to attend Sunday services together, Dad sitting in a pew and Cheyenne lying quietly at is feet. For me, the past dropped into place, completing a puzzle that I had not seen before: the sympathetic voice that had just read the right article... Cheyenne 's unexpected appearance at the animal shelter. . ...his calm acceptance and complete devotion to my father. . and the proximity of their deaths. And suddenly I understood. I knew that God had answered my prayers after all. No doubt the story is a very interesting one. 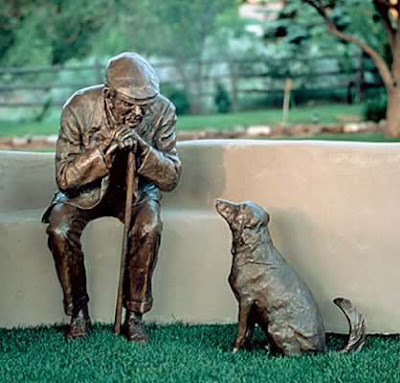 That perhaps an angel of mercy, in the form of a dog came to turnaround the life of a lonely man. But still, I cannot help but thought that how nicer if that angel has come in the form of a good lady instead! A man always need a woman, its the law of nature? Then again, I suppose angels really can come in many forms! I hope you are back again at your blogging best, after the unxpected 'pains in Spain'. And that you already got your fair share of angels to help out! But dont despair if they dont come to your rescue. In the end, you 'll come out of it too! Always something good in something that seem bad! Our good friend Robert Foo's email was hacked badly this morning. Some of us received email purpotedly from Robert. In d email Robert requested for a loan to cover up his bills in Spain where he was robbed! Now pl ignore these spam mail out to cheat Bob's friends.